While some may already be writing obituaries in anticipation of Saab's demise (it has two weeks to live if Spyker doesn't buy it), the troubled Swedish automaker seems to be busy keeping up appearances, unveiling an all-electric version of its 9-3 convertible and announcing plans to build over 100 more. As part of a coalition of companies on the receiving end of $12 million from the Swedish Energy Agency, the company says its high performance ZE Saab 9-3 will be leased to companies and individuals in cities across Sweden, with one example coming stateside to the Boston area. Although it remains to be seen how many of the vehicles will actually be built, the tech beneath the bodywork is quite impressive. Developed by Electro Engine, the drivetrain has twin electric motors capable of producing 335 hp which can take the front-wheel drive to 60 mph in about 6.5 seconds. Top speed is about 112 mph (180 km/h). The original spec sheet for the car claims a 26 kWh battery good for over 93 miles (150 km) but this version may have a different pack. The other high-tech partner involved in the project is battery-maker Boston Power, whose advanced cells could give the machine the 155 - 186 mile (250 - 300 km) range being quoted in the Swedish press. If the worst happens and Saab is unable to fulfill its part of the plan, we hope another platform can be adopted. The vehicle is the first application of the Boston Power's Swing battery and we've been super-curious to see how their impressive specs (PDF) translate to the real world. Hit the jump for a brief press release and a demonstration of the first, and possibly last, electric Saab. Thanks to Björn for the tip! Coalition debuts all-electric ZE Saab 9-3 originally appeared on Autoblog Green on Wed, 16 Dec 2009 16:03:00 EST. Please see our terms for use of feeds. 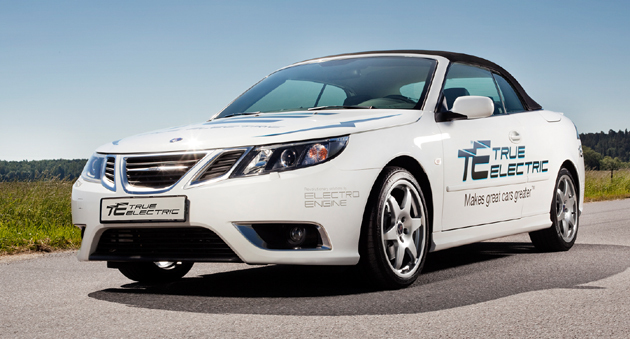 0 comments on "Coalition debuts all-electric ZE Saab 9-3"